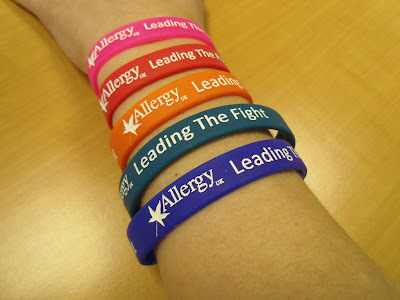 It's Allergy Awareness Week and Allergy UK contacted me to ask if I would help promote their new campaign. Allergy UK Nurses Appeal - "Allergy UK have today launched a nationwide fundraising appeal to raise £1 million to provide specialist allergy nurses within communities across the UK. Our recent research showed that an allergy epidemic made worse by poor resources within the NHS, has left sufferers feeling terrified and abandoned." Dare I say it was 20+ years ago since my allergies were diagnosed, time flies, but it also got me thinking. I thank my lucky stars that the GP I saw as a child was on the ball and got me allergy tested. However, since that initial diagnosis I have never had back up support from the NHS. Just recently I have heard varies stories of people struggling to get allergy tested. I can see how the campaign for Nurses has arisen, it is a much needed service. Fundraising - "We are always on the lookout for fundraisers to get involved with exciting challenges or to organise events to help us reach our final target. We are asking for a small donation of £1 for our new appeal wristbands. We can also supply these for fundraising activities. We've got lots of fundraising activities planned already, including 11 year old Izzy who will be jumping on a rowing machine to row the distance of the channel! Check the website for more fundraising info." Let me know if you plan on supporting the campaign. I'm happy to RT any blog posts or fundraising events on Twitter. Oh no that is no good at all, I think some GPs have very little understanding of allergies/intolerance.